being held on behalf of Family Transition Place. Why: Raising funds for Family Transition Place. How: Click HERE for event poster. Welcome bubbly at 6:30 p.m., dinner at 7:00 p.m.
Bethell Hospice Foundation and Family Transition Place. How: Click HERE for event details. Contact 1-866-HOCKLEY for tickets. What: Soup Sisters Orangeville/Dufferin Monthly soup making events that support the women and children of FTP. When: April 28, 2019, 5:00-8:00 p.m.
Why: Will provide litres of soup to FTP. Soup Sisters Orangeville/Dufferin Monthly soup making events that support the women and children of FTP. May 26, 2019, 5:00-8:00 p.m.
Will provide litres of soup to FTP. Smashing Nines Event – Perfect for beginners to season golfers. Build relationships and network in a fun, relaxed nine-hole tournament. Enjoy nine holes on course activities and lunch. Hear Far’s Rules for success in business and life. Registration begins at 9am – Shotgun starts at 10am. Lunch (included) at 12:30. Why: Raffle proceeds to support Family Transition Place. How: Click HERE for event details. to be donated to Family Transition Place. How: Click HERE for event Facebook page or contact Alyssa Stoddart at ackstoddart@gmail.com for more info. Customer Appreciation Event – barbecue, face painting, bouncy castle, raffle prizes, and more! 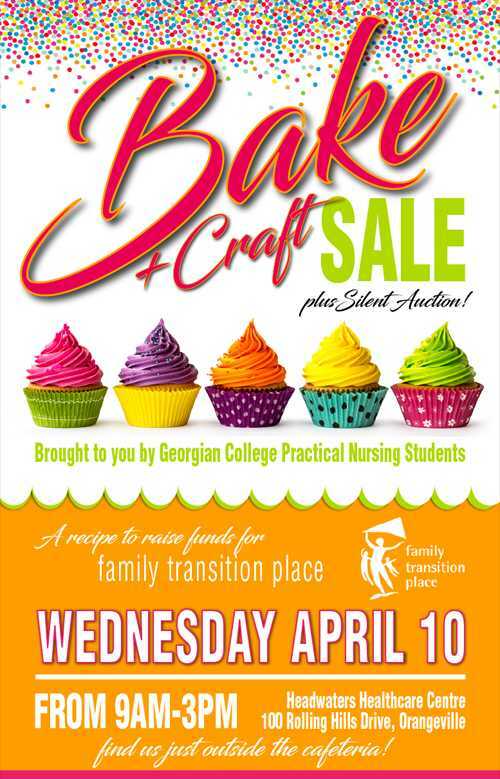 This is a great month to hold an event in support of Family Transition Place! Click HERE to find out how! Ferguson Memorial Walk Picturesque 5k walk around Island Lake, BBQ and silent auction. Raising awareness and funds in support of Family Transition Place. How: Check back HERE later for more details. October 27, 2019, 5:00-8:00 p.m.
Dog cookie sales throughout the month of January. Variety of flavours available, as well as gluten free. Why: Proceeds to support FTP. Hailey’s goal is $1,000. How: Click HERE for more info. Monthly soup making events that support the women and children of FTP. When: January 27, 2019, 5:00-8:00 p.m.
February 24, 2019, 5:00-8:00 p.m.
March 3, 2019 5:00-8:00 p.m.
Hosting an assortment of vendors with a little something for everyone. When: March 31, 2019 10:00 a.m.-2:00 p.m.
Why: 10% of all vendor table fees will support FTP. How: Click HERE for more information.